MEDFORD, Ore. (AP) — Amari Prewitt-Williams was born a healthy baby, but at 3 weeks old, she developed a fever and meningitis — inflammation of her brain and spinal cord membranes. Elena Williams, a certified nursing assistant at Asante Rogue Regional Medical Center. Fortunately, the family of two working adults and three children was chosen to receive a Rogue Valley Habitat for Humanity home. Williams is putting in 200 hours of construction work for the house, and friends and family members are contributing 300 hours. The monthly mortgage for the four-bedroom, wheelchair-accessible house will cost between $600 and $700, Williams said. "We were blessed to have this opportunity," she said. Habitat for Humanity is on the front lines of a local affordable housing crisis. The rental vacancy rate has dipped to about 2 percent, rent costs are rising and the median existing home sale price in Jackson County has risen from $145,000 in 2011 to $221,500 this year. The 2007 recession triggered a wave of foreclosures, and many developers, builders and subcontractors went belly up. Although times were tough, Habitat for Humanity did what it could to make the best of the situation. "One of the largest hurdles for us is buying land. The recession helped us because land became available and we could purchase foreclosed homes," said Denise James, executive director of the local organization. Isabel Cortez, a divorced mother of three now living in a bedroom of her parents' house, is receiving another Habitat for Humanity house. Although construction hasn't yet started on the house she will live in with her children, Cortez already has logged half of her required construction hours by helping build homes for others. "It was really nice building homes for other people and seeing the houses and their faces. I love working on houses," said Cortez, who works at Amy's Kitchen. "I'm so happy and so thankful for Habitat for Humanity. I'm very grateful. I was shocked when they told me I'd been chosen." The Housing Authority of Jackson County is among the government agencies straining to meet the need for affordable housing. It has 5,416 people on a three-year waiting list for rental vouchers that can be used on the open market to supplement the amount people can pay for rent. The Housing Authority also builds and manages its own housing. With new projects in the pipeline, the agency will manage nearly 1,500 units, said Jason Elzy, director of development. The Concord, a $12.5 million apartment complex with 50 units being built in downtown Medford, is its largest current project in Jackson County. Rent will range from $456 to $584 for one- and two-bedroom apartments. The Housing Authority will open a waiting list for spots in the building in the early fall, a few months before the building is finished, Elzy said. He expects the apartments to be snapped up in a matter of hours. "The last time we had a project, we had families sleeping in front of our building to be the first in line. By the time we opened at 8 a.m., the line was wrapped around the building," Elzy said. "We expect the same response for The Concord." Elsy said government housing programs cannot keep up with the need for affordable housing. "The problem is not going away anytime soon. We're barely making a dent," he said. After the 2007 recession, many homeowners who lost their jobs and houses turned to the rental market, which pushed up prices and strained the supply. Many former homeowners were hesitant to buy again in a shaky economy. With the economy improving and rents increasing, more people appear ready to dive into home ownership, said Colin Mullane, spokesperson for the Rogue Valley Association of Realtors and a principal broker with Full Circle Real Estate in Ashland. Homes spent an average of 73 days on the market in 2015, but are now bought in 48 days on average, according to the association. Mullane said he helped an Ashland worker paying $1,650 in rent find a house in Medford for a $1,200 monthly mortgage payment. "At the end of 30 years, the house is yours — and the rent doesn't go up," Mullane said. The Rogue Valley Association of Realtors created a first-time home buyer assistance program in 2012 that allows buyers to receive grants of up to $1,000. Funded with proceeds from the Rogue Valley Food and Wine Classic, which takes place on March 31 this year, the program has $25,000 in grants to distribute in 2016, said Tina Grimes, executive officer for the association. The program is administered by the social services group ACCESS Inc., which offers a host of programs to help home buyers. They include the "Realizing the American Dream" pre-purchase education class, the Dream$avers down payment savings program and online home buyer education classes. For people having trouble finding a place to rent, the Ready to Rent class teaches people skills that include checking their credit report, interviewing successfully with a landlord, filling out rental applications, gathering their pay stubs and financial information and explaining rental history or credit problems, such as an unpaid medical bill. "It can help a client address barriers before being continually told 'no' by a landlord," said ACCESS Grants Analyst Donna Lea Brooks. With extremely low rental vacancy rates, competition is fierce and people with a negative rental history or credit problems often lose out, she noted. "They are competing against folks without screening barriers. Who is the landlord going to pick? The one without issues," Brooks said. "This gives them the tools they need to be less of a risk to landlords and bolsters their self-esteem. Then we continue working with them so they remain successfully housed." During a short session that ended earlier in March, the Oregon Legislature passed bills in response to a statewide affordable housing problem. One bill bans rent increases in the first year of tenancy and requires 90 days' notice for rent increases in subsequent years. While good for renters, the bill isn't necessarily a bad thing for property owners, said Dave Wright, president and owner of CPM Real Estate Services, Inc., which manages 2,100 units for property owners. "No rent increases for the first year are helpful for the market we're in right now," he said. "I've talked to a few of our clients and they think giving more notice about rent increases gives tenants more of a chance to relocate if they can't afford it." Local governments will be allowed to mandate that builders set aside a portion of large developments for affordable housing in exchange for incentives such as tax waivers and the ability to construct taller buildings. They can also adopt construction taxes to fund affordable housing projects. Wright cautioned that efforts to address affordable housing issues could create unintended consequences and higher prices. "Ultimately, if the legislation goes too far, it gets passed on to the consumer in one way or another," he said. 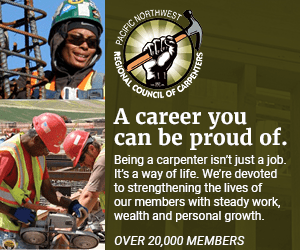 The affordable housing bills that passed this year represented a compromise between the desires of builders and housing activists, said Oregon Home Builders Association Chief Executive Officer Jon Chandler. "They were drafted to minimize unintended consequences. The housing activists don't feel they went far enough. I think they struck a balance," he said. "You can't make someone build a project that they'll lose money on." He said the construction tax will give cities resources to fund affordable housing projects. Chandler said 25,000 housing units need to be built each year to keep pace with Oregon's population, but only 15,000 are being built. A lack of lending to builders and would-be home buyers, high land prices and infrastructure costs, and a shortage of skilled construction workers are all issues that need to be addressed for housing to become more available and affordable, state and local experts said. Boosting vocational training in schools and at the community college level would not only increase the number of skilled construction workers, it would allow workers to earn living wages and pay for their own housing, Chandler said. "Construction jobs cannot be outsourced because they are building houses in local communities," he said. "Those are family-wage jobs. They make good money. In our societal shift toward college prep, we forgot you could make $60,000 a year."